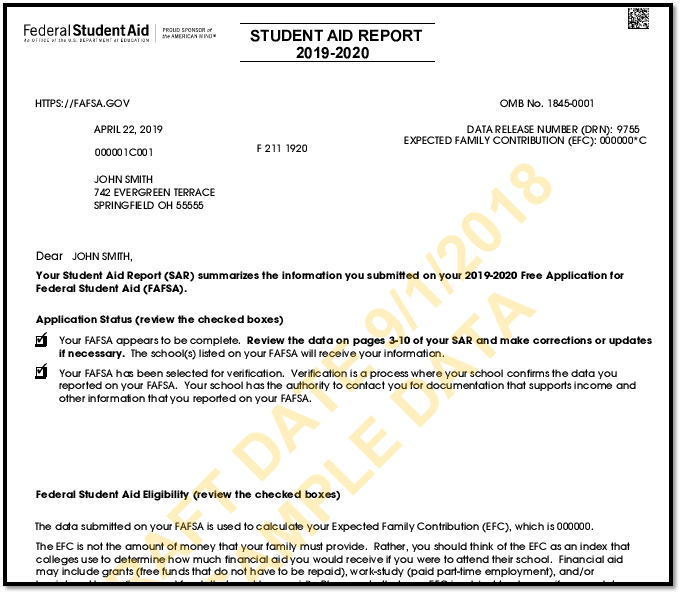 After you complete the FAFSA (Free Application for Federal Student Aid), you will receive a Student Aid Report, or SAR. It summarizes the information you provided when you completed the FAFSA. It includes your Expected Family Contribution (EFC), which colleges use to determine your financial aid package. When will your SAR be ready to be retrieved? two to three weeks if you mailed a paper FAFSA, depending on whether or not you supplied an e-mail address. To view your SAR, log in to fafsa.gov and select View or Print Your Student Aid Report (SAR) from the "My FAFSA" page. You also can call the Federal Student Aid Information Center at 1-800-4-FED-AID (800-433-3243). Provide additional information, if requested. If you find errors, follow the directions to correct the information.